We have a quiet week as far as making dinner because we have lots of fun social plans, so we’re going to post a few lunch recipes too, just to keep things interesting. We went to the Yankee game Sunday afternoon with our friends Jeff and Marie. As per usual, we ate our share of fun ballpark food, so we’ll have a little snack at most for dinner. While Kim has a meeting at the New York Junior League on Monday, Tony will be out for dinner with his buddies, so Kim will be on her own once she gets home. While our dinner plans are different, we’ll probably have the same thing for lunch: The New York Times’ Green Garlic Tabbouleh. Kim made tabbouleh a few weeks go, but this recipes gives things a fun twist by using spring garlic, which is in season right now, but not for much longer. Kim is going to a lecture Tuesday night and Tony will probably end up working late, so we’ll either meet up somewhere for dinner or just meet at home and order in. On Wednesday, Tony will be having dinner at a work event, so Kim will be on her own. Again, different dinners, same lunch, in this case The Minimalist Baker’s 30-Minute Portobello Mushroom Stir Fry. We’ve found that despite Lent being long over, we’re still skewing pretty vegetarian/pescatarian, and this dish fits the bill, though Tony may add a little chicken to it to mix things up. 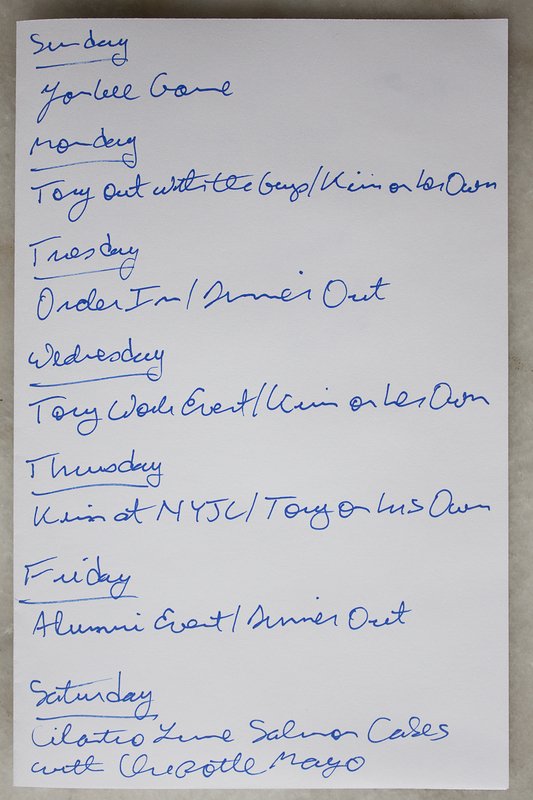 Kim will be back at the New York Junior League on Thursday, so Tony will be on his own for dinner. On Friday, we’re going to an event organized by Tony’s university alumni organization: an exhibit of the works of Robert Ryman to be held at the Dia:Chelsea on West 22nd Street. We’ve had a lot of fun at previous alumni events, so we’re looking forward to this one. We’ll probably grab dinner somewhere near the gallery. We have tickets to the ballet on Saturday, but will probably have dinner at home in the form of Food 52’s Cilantro Lime Salmon Cakes with Chipotle Mayo. If you’ve been following our blog for the past few weeks, you might notice that this is the third time we’ve had the recipe on our weekly menu. We really want to make it, but just haven’t been able to get to it yet. We’re committed to making it this week though and know we will enjoy it!